Working as a paragliding instructor has many priviledges. One of them is to be able to wake up early in the morning and see the morning mist slowly and beautifully evaporate while heading to a local airfield. It often makes me feel sorry for the co-travellers on the highway on their way to their office cubicles. To be able to spend a day outside in a context of this bizarre art of free flying with like minded, enthusiasted young guns makes me find that joy and thrill of the first flights over and over again. In Finland where everything seems to be either forest or lake from above, it’s also flat. Very flat to be precise. We see yearly only a handful of lucky cross country flights starting from the thirty meter high lakeside beach cliffs. So, our instruction as well as flying in general takes place mainly on small aircraft airfields or frozen lakes by towing. Getting your feet up from the ground for the first time when a thin line drags you into the air sure is a thrilling experience for everyone. First, we take a few small hops to the air to make sure the student is not panicking and knows how to steer the wing and bring down the glider somewhat safely and after that it’s usually time for the first high, three to fourhundred meter tows. This time, however, we wanted to make things a bit differently. The brave souls right in the beginning of their flying careers chose to join us to European free flying Mecca, Algodonales, Spain. I have been coming back to southern Spain for decades, first for sport climbing and nowadays for flying and was more than comfortable to bring some young blood to our hoods. The rough countryside with a view of green and brown hills, big limestone cliffs and mountains, vultures flying with pilots and the incredible heat of over 25 degrees are almost overwhelming for arctic flatland flyers like us. 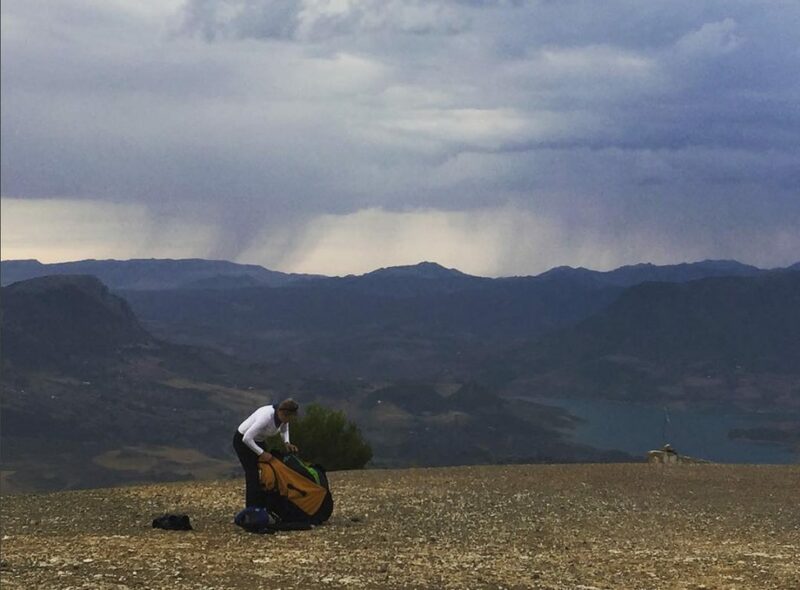 Once our group had arrived we were welcomed by a proper Andalucian thunderstorm, which we of course wanted to see close by. Off we went to Sierra de Lijar, the main launch site raising just behind Algodonales village. The first lesson was taught by just listening a constant rumble and feeling the sheer force of the storm; thunderstorms are way nicer to observe when you have your feet firmly on the ground, or even better, inside a Faraday’s cage in a car, not in the air under the glider. The emotional rollercoaster that we more experienced pilots are so familiar with, started for our fledgelings: “Is it going to be like this the whole week? Is it flyable if we wait for a few hours? Is it flyable in the morning?” It must be annoying to hear the same answers over and over again but that is the truth: it is what it is and we take what is given to us when the time comes. We used the high wind days for laying a firm base for groundhandling skills, sliding off the small bumps and getting ready for the big stuff: the first glide down from Mount Lijar. Those of you living in the mountains might not understand how special it is to see the landscape and feel the exposure on the launch for the first time but I can tell you, the experience is something you never forget at least for us flatlanders. In the beginning of the flying career, the weather window is unpleasantly small. The wind has to be not too strong and it has to be bang on to our launch. The thermals are unwanted company and the airmass should be nice and smooth with no layers of stability, wind shear or other weird stuff. Finally, we had perfect conditions greeting us in one sunny morning. I forecasted a perfect but short slot for the fledgelings to take off before wind picks up later on the day and thermals are starting strong right after the sun burns off the inversion. The perfect gear makes things so much easier for students even if the wind played a little tricks by coming a bit from the side. IBEX 4 and PRION 4 offered a smooth, non-event launches to the students and off they went! The worried and concentrated faces soon turned into big smiles in the landing field. There are two kinds of people: those who have flown from a mountain with a plastic bag and those who have not. Welcome to the club of the first one! Even if we had had plenty of time before for training how to gear up and prepare for the flight, the hard lesson was taught for some. When the window closes, it closes. The air doesn’t care if you got your gear sorted out in time or not, when it’s too late for a student skill level, the harsh but necessary duty of the instructor is to call it a day. Lesson learnt there. Overall, I think the best lessons instruction-wise to take with us were the decisions when not to fly. 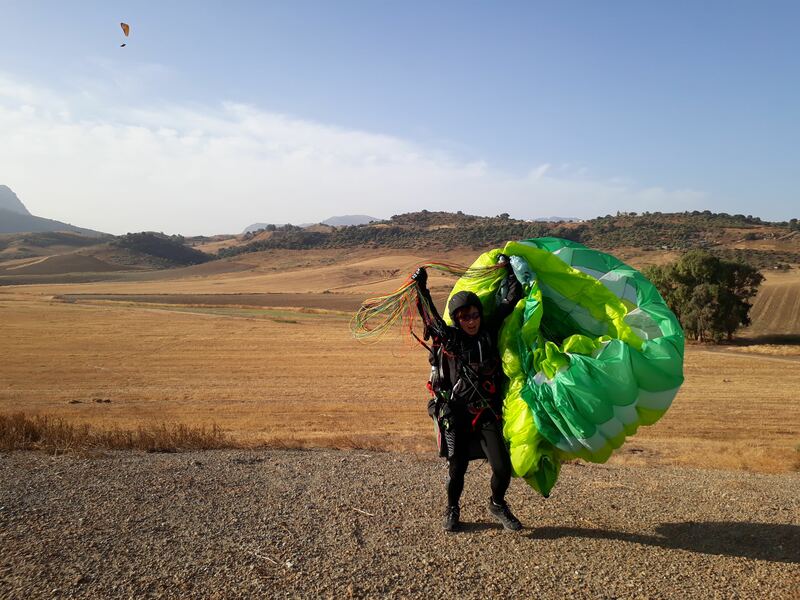 It sounds far from good marketing, “come to Andalucia NOT to fly with us”, but this time I’m happy we had these moments, too. 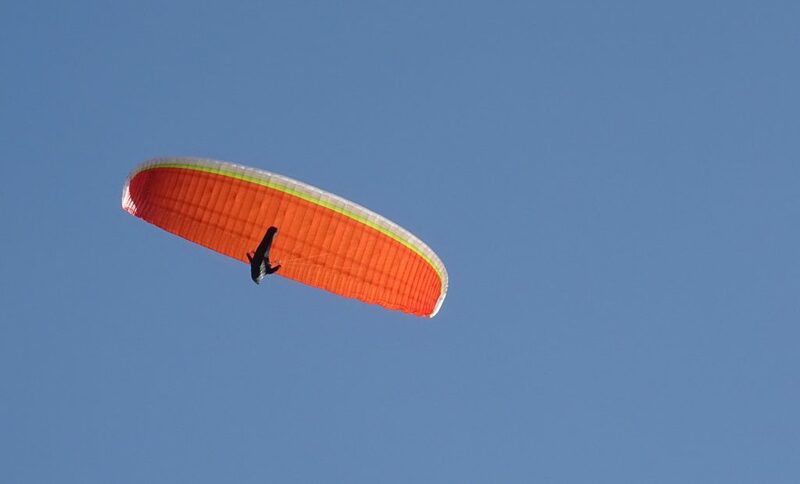 Sometimes it takes more mental courage and knowledge to say no and pack a glider than run off the mountain for a sketchy glide down. I hope our fledgelings got the idea of the spirit of our alligator-type sport: lots of lying in the sun, in the wind and in the rain just waiting, and when it’s on it’s time to go full monty, the whole shebang and the whole nine yards. And, oh boy, we did just that, having everybody fly off the mountains of Lijar and El Bosque when it was on, soaring in Matalascañas beach and having fun over Twin Peaks with vultures with more advanced pilots. The spark was lit for everyone. Now, it’s time to grow those wings and get ready for new and bigger adventures! for the stor and a warm welcome to the NOVA PIlots Team! super nice a big hug! Really nice! Thanks for sharing! !